Adapted by Mrs Millar from pupil diaries. For more information and photos from the 5th Our Lady’s Pals Battalion, please see Mr Smith’s website and Twitter @OLHSSocSubjects. The 5th Our Lady’s High School Pals Battalion, led by Mr Smith and Kat Brogan of Mercat Tours, and accompanied by Mr Donnachie, Miss McGhee and Mrs Millar, set off for Belgium and France on Monday 20th June. We travelled by ferry from Hull and had a comfortable crossing to Zeebrugge – great food and accommodation onboard! Our first stop in Belgium was at the Pool of Peace, followed by Messines Church, then Hooge Crater museum where we had lunch, then onwards to Sanctuary wood where we donned wellies in order to experience life in the trenches. We reached Munchenhof around 5 and checked in to our very welcoming hotel where we were again well fed! On Tuesday we set off to France. Our first visit was to Newfoundland Park, a beautiful, tranquil place dedicated to the Canadian soldiers who fought in the war. We were privileged to walk across the battlefield and witness where the soldiers fought the Battle of the Somme: tragically, 91% of them did not make it back home. They are also remembered at Vimy Ridge, with an awe inspiring monument showing Mother Canada weeping for her lost children. We also visited Poiziers cemetery, where 14000 soldiers “Known Unto God” are remembered. This is the inscription carved on the memorial stones when soldiers who died could not be identified – or in some cases, even found. We were also proud to share a special moment with Robyn Leach, as she laid a wreath at the grave of her great great grandfather. Thursday began at Essex Farm to visit the advanced dressing station where Lieutenant John McCrae wrote his famous poem “In Flanders Fields”. Next stop was Polkapelle Cemetery, where over 6000 of the 7400 men who lie there are only “Known Unto God”. We then visited Passchaendale, where half a million men died in 1917. We visited Tyne Cot Cemetery, the biggest Commonwealth cemetery in the world with 12,000 graves. Here, too, the lost men are remembered: 35,000 men – whose bodies were never found – are commemorated on the walls. Our next stop was at one of only four German cemeteries at Langemarck, resting place of over 40,000 German soldiers. After lunch we set foot in the Sacred City of Ypres for the first time, to visit the graves of two British soldiers shot at dawn by their own side. Lastly, we attended the Menin Gate ceremony in Ypres, where once again we were able to share the experience of finding a relative’s resting place with Lauren McCann. Our last official duty of the trip was when we then went on to Poelkapelle Cemetery to conduct our own memorial service. Each evening, before dinner, Kat Brogan, our Tour Guide with Mercat International Tours, worked with the young people as they reflected on their experiences, writing in their daily diaries. Later, everyone enjoyed some down time, playing pool, bowling, watching TV or just chatting. Our last day in Brugge saw a raiding of the chocolate shops and a scoffing of ice cream and delicious Belgian waffles before heading back to Scotland from Rotterdam on our second ferry – which was even more luxurious than the first one! After a fantastic meal, everyone took to the floor – even the oldies – and danced the night away, finishing the night with a rendition of “It’s A Long Way to Tipperary” which brought the house down and made us many new friends! 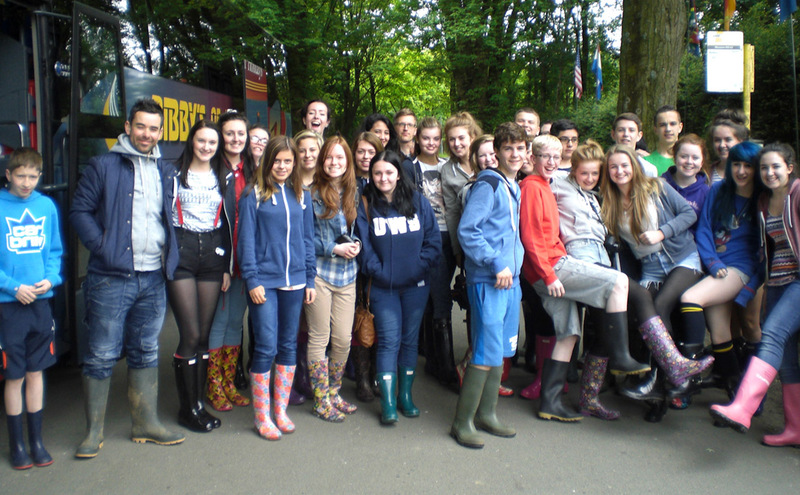 The trip was both a lot of fun and very thought provoking – a real life changing experience for staff and pupils. Thanks to Mr Smith for organising a truly memorable time for us! The 5th Our Lady’s High School Pals Battalion will set off for Belgium and France today. You can follow the trip on Mr Smith’s blog, and also via Twitter @OLHSSocSubjects. S4 Geography pupils visited New Lanark on Thursday 2nd June to find out about how the facilities there are powered exclusively by water power. We hiked up to the Falls of Clyde and admired the view, and we had guided tours of the living and working conditions when New Lanark was a functioning cotton mill. Pupils are enhancing their political literacy knowledge and skills by learning about the European Union. They are developing their understanding of the arguments for and against EU membership and will take part in a whole school mock referendum next week. S5/6 are preparing for taking part in the International Conference. Our Lady’s team will represent Syria this year and are very much looking forward to this event. Final preparations are underway for the battlefields trip on June 20th when Our Lady’s High School’s 5th Pals Battalion will fall in for duty and head off to Belgium and France. Four senior pupils volunteered their time to talk to S3 English about their experiences on the Battlefields Trip. Philip Quither, Ross Walker, Liam McCafferty and Grant Mackin provided an excellent illustrated guide through the life of a soldier on the Western Front, with photographs of France and Belgium both now and during the First World War. This talk will be of enormous benefit to 3rd year pupils when they begin studying poetry of World War I. In June of next year current S3 and S4 pupils will travel to the First World War battlefields in Belgium and France in commemoration of those who served during the conflict. In order to raise funds to go towards the fieldtrip there will be a race night in St Bride’s Hall, Coursington Road, Motherwell on Friday 18th September. Doors open 7pm with a 7.30pm start. The bar will be open so the event is for over 18s only. There will be 8 races in total, with the opportunity to place bets on the races. You also have the opportunity to “buy” a horse in advance for £10. You can name the horse yourself. If your horse wins the race, you will receive a star prize. There will also be a raffle, and all donations to that will be gratefully received. Tickets are priced at £3 and are available from Mr Smith. Copies of this letter have been distributed to all pupils today. On the 9th of June the 3rd Our Lady’s Pals Battalion led by Colonel Smith, Major Letham, Lieutenant Pegard and Captain Halket left Motherwell to visit the Western Front. We followed in the footsteps of those men who fought at Loos and the Somme in France and Ypres in Belgium. The atmosphere on the bus when singing the First World War songs. The 3rd Our Lady’s Pals were outstanding. The monuments at Thiepval and the Menin Gate which are dedicated to the missing in battle. We visited the grave of one of our own from the Motherwell/Wishaw district. In a very moving ceremony we placed a cross and a poppy on the grave of Private Peter Lynch from Cleland. Peter was the great-great-uncle of Daniel Leonard and this was the first time someone had paid a visit to his grave. We had a great time on the Ferry. We all loved the food and the disco. Members of the public on the ship were so impressed with our dancing and singing that we received standing ovations. Corey Slavin’s dancing in particular was amazing. In the beautiful medieval city of Bruges we went sightseeing on the canal boats and on the horse and carriages. There were so many souvenirs to choose from and most of us brought back masses of Belgian chocolate. We were promised before we left on the trip that we would return to Motherwell as changed people. This has undoubtedly been the case. For more information and pictures, check out this site. S3 pupils ran a successful coffee morning to raise funds for their school trip to France and Belgium next month. Pupils from S3 and S4 will form the Our Lady’s High School 3rd Pals Battalion (two groups from the school went on tour in 2009 and 2011) and will visit some of the battlefields, memorials and cemeteries of the First World War. There will also be a visit to Bruges. Many thanks to The Bentley Hotel, Ossam Beauty Therapies and Toni Macaroni’s for donating raffle prizes. Photos and stories from the trip will follow when we return! Our Battalion was dispatched from the military base in Motherwell at precisely 2100 hours, accompanied by General Sam. After a few days capturing reconnaissance intelligence in German Occupied France, we reached our destination: Belgium. Ms O’Neill: On the 4th June two bus loads of over-excited pupils and already tired teachers left Our Lady’s High departing for France and Belgium. Ms Broughton: On arriving at the school, we were told that this wasn’t a holiday, it was a life changing experience. We were no longer a group of pupils, we were the 2nd Our Lady’s High School Pals Battalion. We were going to relive the tragedy of World War I. We waved goodbye to our families just the same way the soldiers of 1914 did and then we were off. We travelled during the night to Dover where we got the ferry to Calais. Ms Togneri: Thinking back, the journey was long and excruciating, but of course no-one noticed: we were all too busy singing, laughing and generally causing a riot due to our excitement. We arrived in Paris the following day, and spent the next two days there. Ms Broughton: As soon as we arrived in Paris we were given a moment to change and then we were off to the phenomenal Eiffel Tower. Ms Togneri: During our time there, we visited the Sacre Coeur and the Eiffel Tower, took a boat trip down the River Seine and went shopping to buy souvenirs for loved ones. Personally going to the top of the Eiffel Tower was without a doubt my favourite. I was so scared yet fascinated. Ms O’Neill: On our last night in Paris we were given free time to visit some shops. They sold lots of little souvenirs and ‘I Love Paris’ memorabilia. Each shop you entered swore they could offer you the best deal, and if brave enough, you were able to haggle with the shop owner to try and get an even cheaper price. Out on the streets, artists with their canvases approach you ready to draw you your very own portrait. Each street has another handful of cafes with pastries smelling yummy. With great honour and respect, we passed into the battlefield linked with the blackest day in British military history, The Somme. Our Company was inspired by the bravery, courage and honour of those soldiers, over 400,00 of them, who died during that battle. Ms Togneri: It seemed like no time at all until we were on our travels to Belgium. During this bus journey we prepared ourselves for the emotional next few days we knew we had to face before us. Ms Broughton: In Belgium, we saw many war memorials that I will never forget and had opportunities to walk through trenches that have been in the exact same condition that they were in during the War. We saw cemeteries of British, French and German soldiers. There were many differences between the two enemies resting places. Ms Togneri: France and Belgium, or as we called it Frelgium was an unforgettable experience for my classmates and I. Singing war songs on our travels, getting a taste of the French lifestyle, visiting cemeteries and memorials of those who fought in World War I, I will not forget any of it. Ms Broughton: eventually our journey came to an end and we were home with our families. However, our thoughts went to the people that never returned: the dead and missing of the Somme. 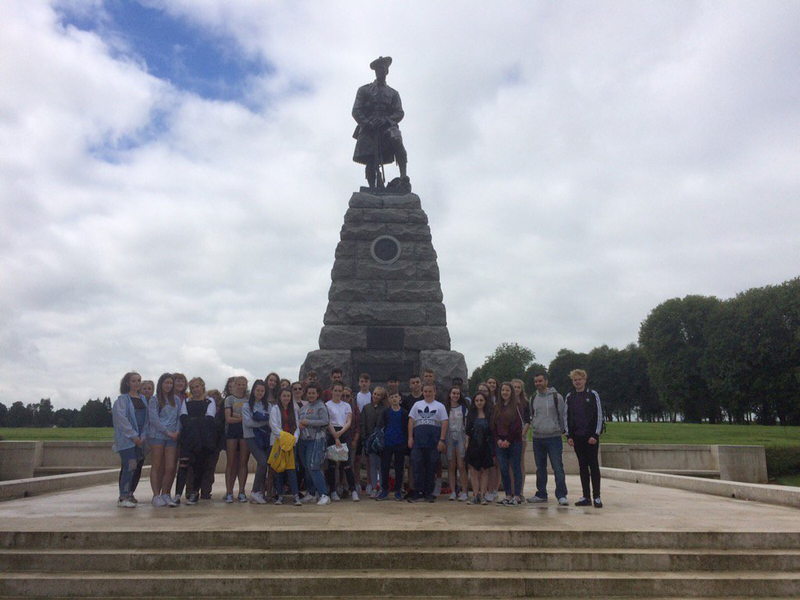 35 pupils from Our Lady’s High School travelled to Belgium and France during the final week of term to take part in a memorable World War One Battlefields Experience led by an excellent guide from Mercat Tours. After an overnight ferry crossing from Hull to Zeebrugge, the group travelled to the southern lip of the Ypres Salient, visiting the small Belgian town of Messines and standing in the very room in which an injured Adolf Hitler was treated during the First World War. That afternoon the group donned their wellies to stand up to their knees in the mud of the trenches at Sanctuary Wood, and listened in awe to stories at the Pool of Peace, Hooge Crater and Hill 60, before travelling along the Menin Road, the scene of such bitter fighting as both sides battled for control of Ypres. Day 3 was a full day visit to France and the Somme battlefields where drama and roleplay brought the horrors of the battles to life as the group toured Beaumont Hamel Ulster Tower, La Boiselle, Pozieres Ridge, Vimy Ridge and the Thiepval Memorial where two pupils laid poppies in memory of relatives who had been killed in action. On Day 4 the group journeyed to the northern lip of the Ypres Salient to visit the Allied cemeteries at Essex Farm, Poelkapelle, Passchendaele and Tyne Cot, and the German cemetery at Langemarck before holding their own memorial service at the Menin Gate in Ypres. Here another pupil was able to leave a poppy as a mark of respect to a relative killed in action. The final day was devoted to sightseeing and souvenir shopping in Bruges before the journey back to Motherwell. Throughout the week pupils also read poetry and sang songs from the period, climbed in and out of German pill-boxes and marched as soldiers, but most importantly were challenged to think, discuss and reflect on their experiences of an unforgettable week.